REALTOR® Jen Monjaras joined P.J. Morgan Real Estate in 2014 as a master of trades. Her background includes sales, business development, client services and marketing, all of which have enriched her impact on the company. 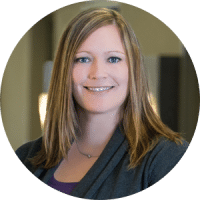 Jen’s business acumen, combined with an obsessive attention to detail and a passionate, client-centered approach, allow her to consistently exceed her clients’ expectations. She strives to make the home buying or selling process as pleasurable and as fun as she can, and she knows how important finding the perfect place to call home is. A native of North Platte, Jen holds a Bachelor in Communication Arts from Bellevue University, where she also played softball. She and her husband live in Omaha and enjoy spending time with their adorable children, Larsen and Camila, and their friends and family.